Poor choices make up the majority of sins we allow entry into our routine lives. Poor choices showcase our inate selfishness. These choices derail our quest for holiness and drip with the ugly residue of the enemy's presence. They steer us away from our conscience... away from the Holy Spirit. Poor choices - YUCK!!! How driven are we when it comes to living courageously, abundantly, effectively, successfully for the Lord? How frequently do we start out our days in prayer and communion with our Master? Do we seek Him regularly with intention... deliberateness... discernment... divine leading? Are our plans focused? Are our feet stable in His word? Are our choices good, biblical choices? I hope so. I have a wonderful Aunt that once taught me the greatest lesson about "how" to approach each day in faith and avoid the snare of making selfish, poor choices. She said that she starts every day an hour earlier than her family. 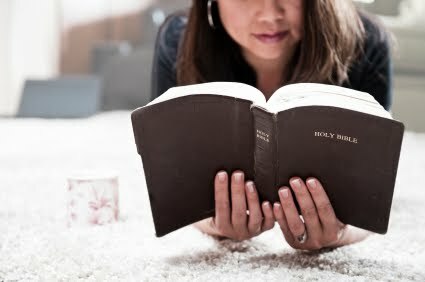 With her "to do" list and schedule in hand, she lays everything at the feet of her Almighty King in prayer. (This includes feelings, health issues, desires, bills, meetings, family, friends, etc.) Then, if something unexpectedly changes in the course of her busy day (a certainty), she is able to handle it with grace... trusting that God brought the situation or person into her life for a reason. She is then able to take a moment to regroup and seek the Lord's leading. Sure, she is always hit with surprises and her schedule is crazed, but she begins at the starting line of each new day with deliberate intent to follow the teaching of her Savior and give over her plans to Him first. That way, her plans are covered and driven by His plans, His leading. When Satan drops in with a surprise temptation to make a poor choice, she is already prayed up, equipped with scripture, thinking on whatever is pure... noble... lovely. She is ready to face anything because Jesus has provided her daily portion and is walking with her - guiding her in Spirit. I love this. When Christ came to earth, He lived each day making the best choices. He approached every day with eternal focus and had purpose to follow the plan and teaching of His Father. He started every quest, every endeavor with intention... deliberateness... discernment... divine leading. He was stable and knew the Word of God intimately. Yes, He was interrupted constantly by others and tempted greatly by Satan. Yet He never made a poor choice. He never said, "Ya know what, I'm busy and really tired right now, so ya'll have to just figure it out on your own." Or, "If I don't address this now, surely God will handle it later." No, Jesus lived each day deliberately... diligently. From the moment He was born - until the moment He died - until the moment He rose again... Jesus showed up and lived up to His calling. He made good choices by living and knowing God's perfect will. We should do the same. Friends, let's seek God first each day and welcome His presence into every decision we make. To be people of courage... to be strong and deliberate... to stand firm in our faith. Let's stop pretending that our daily routines are average and meaningless. Rather, let's be on guard and humbly attentive to the choices that face us each moment. Let's live our lives with significance that showcases Jesus in every single breath we take. Let's sparkle with His love. Let's be prepared to obediently live following His ways. We each are responsible for our own walk. We are accountable for how we choose to behave and live out our faith. Our choices, both poor and great, are decisions to follow the cross or follow self. Mother Teresa so aptly put it this way, "We can do no great things, only small things with great love." This is so true. By dedicating our every day to God first, we are more easily able to keep our eyes on heaven and love others selflessly. God can use such a woman to point those who cross her path to see a glimpse of His throne.... to feel His love... to experience His grace. Oh, how I long for Him to use me as His Devoted Woman to glorify His Name above all other names!!! Lord, help us to make good choices that always seek Your holiness. Thank God that Jesus loved The Father so much to follow God's will each second that He was on earth. Our salvation is due to His perfect example to make good, biblical choices - following The Father's redeeming plan! I am both heartbroken and grateful every time I think of our Messiah carrying the weight of His cross to Calvary to die on my behalf. It takes away all my words. I can only sing, "Hallelujah to the King of Kings! Praise be Your Name, Jesus! You are in charge of EVERYTHING! We dedicate our small everyday choices to you. We give the sum of who we are to YOU to use FOREVER!" My goodness, I really needed this. Thank you so much for your devotionals.